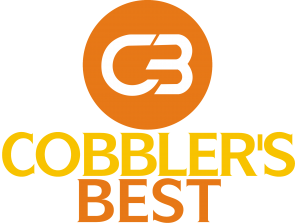 Why is the best shoe stretcher made without any plastic parts? Because plastic breaks when put under stress. Research shows that shoe stretchers made with plastic components frequently break. 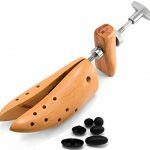 Therefore creating the best shoe stretcher from all wood and metal (only the little bunion plugs are plastic). 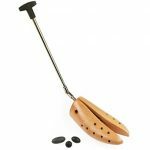 This is a 2 Way Shoe Stretcher which means it can stretch your shoe lengthwise and widthwise. Instructions on how to use this stretcher are printed right on the box. Also included are 6 Bunion Corn Plugs which can be used to loosen any small local area where your shoe causes you discomfort. This stretcher is made from Birch Wood which is a deciduous hardwood and will last for decades. It arrives in the classic navy blue HoundsBay box. A good pair of boots can take you far. Strapped to your feet, they’re always ready to take you up the highest trail, protect your feet at work, and help you cover the most ground in the time between. 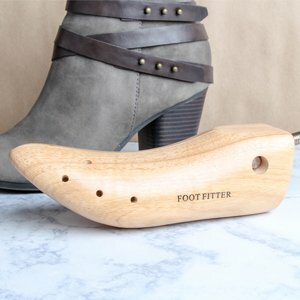 A ridged pair of boots can slow you down, which is why FootFitter created this Professional Boot Stretcher for Dress, Hiking and Work Boots. After all, your boots were made for walking, and that’s just what this essential tool will help you do! After you wore your Western boots or Boots without zipper and you are experiences tightness on the Vamp/instep. 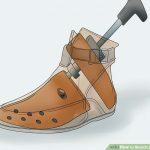 This device will relief the pain from your tight boot. Universal jointed rod use in even very high top boots. High quality wood stretcher. The one used by all professionals and in all Western Boot Shops. Expandable instep raiser helps relieve painful tightness. Professional’s Choice for High Heeled Boots is made to stretch only the width of the boot, leaving the instep unaltered. It features an arch specially designed to fit heeled boots. One single stretcher can alter both the left and right boot due to the shape of its toe block. HIGH HEEL BOOTS: Designed specifically for stretching high-heeled boots. BEECH WOOD: Made of 100% farm-harvested German beech wood. STAINLESS STEEL: Hardware made from sturdy stainless steel parts. 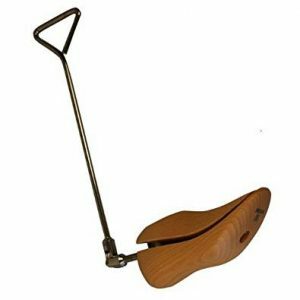 WIDTH STRETCHER: Stretches the width of high heeled boots toe box. BUNION PLUGS: Inserts can be placed in pre-drilled holes for spot relief. 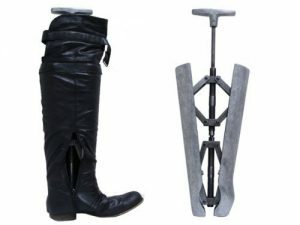 The Cast Aluminum Combination Boot Instep and Shaft Stretcher is a professional device used to stretch the instep and shaft of your boots. It gradually stretches the boot shaft and instep to relieve tightness around the calf muscles. This stretcher has a mechanism which allows for stretching the instep or the shaft of your boots. This heavy duty stretcher will last you through the years and will fit most boots.